I caved. I tried my best not to buy a handbag this sale season but I lost my willpower yesterday morning. I couldn't get a bag out of my mind and when I found out it was going on sale 40% off with no sales tax, I had to do it, despite spending a chunk on new tires recently. Bah. Once an addict, always an addict. My only consolation is that it's got a holographic finish and very hard to find... think Enchanted Polish for handbags and that's what I got. I'm always intrigued by a mystery, and when I saw Pahlish had some mystery polishes for sale I jumped on the opportunity to try one out. I was pleasantly surprised to find a gorgeous black jelly packed full with flakes and gold square and hex glitters. It's like a prettier version of Orly Androgynie and Fowl Play's baby. Application was a breeze, and it was easily opaque after two coats. I had no clumping with glitter or flakes, and it dried quickly especially after a layer of topcoat. Yum! Look at all those pretty iridescent flakes! Those golden squares! Ugh, it's so pretty I can't take it. I hope this polish doesn't remain as one off, because it's much too gorgeous not share with the rest of the world. 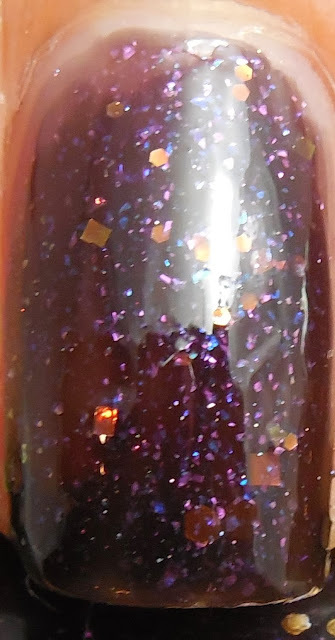 I lucked out with this particular mystery, and I have a feeling that the other mystery polishes that Pahlish had are probably just as unique and amazing. If you have a brand that you've always been pleased with, don't hesitate to jump whenever a mystery polish is available. I definitely don't regret this chance I took and I definitely plan on partaking of more surprises when I can! Have you tried a mystery polish yet, and were you pleased with it? I really like this one! It's super pretty. I have another Mystery polish that I need to wear soon.